tick tick tick tick tick it’s almost time for war. Oh how the suspense makes me fear what a book will really be like. Especially when you get a novella in the middle as a tied me over and it really is a good story albeit not one that’s really aligned in the timeline of the story. in any event, i think that even with my toddler amount of patience and wild imagination, there were places that this second installment took us that even i was unprepared for. so…we meet up with Adam, Kenji and Juliette at Omega Point where Kenji took them as a safe haven and because they too wanted Juliette for her super human powers. As a refresher for those of you who may not have read Shatter Me yet, Juliette has this power that she can incapacitate anyone who touches her skin. she was put into an asylum when she was just 14 because she inadvertently killed a toddler just by her Touch. Adam knew Juliette growing up and enlisted in the Army as a means to provide for his brother since his mother and father ‘died’. Kenji was in the army with Adam and was his best friend for a while when they were there. Adam was then sent to hunt Juliette and bring her back to Warner who oversees Sector 45 and is the son of the COMMANDER SUPREME. Warner held her hostage, adam and she escape, kenji tracked them down and somehow they got to Omega Point. so that basically takes us to where we are – Juliette finds that Adam is alive and is getting better, she meets Castle who runs the place along with various others who ALL have super powers. She continues to develop her relationship with Adam since they know that he’s able to touch her for some unknown reason….and being the only person (other than Warner) who can do that – it’s something that they revel in. So….Juliette has a hard time ‘adjusting’ since she’s not sure if she trusts the motives for Castle wanting her at Omega Point, things are getting very strange outside because Warner and his guards are hunting even more aggressively trying to find Omega Point because they have even more reason to believe that it exists and that there’s something brewing, and there’s just so much complicated stuff going on. While at OP, Juliette discovers that her 2 past bouts of super human strength actually weren’t flukes and that she’s possibly the stronger super human to be found yet – she almost single handedly destroys the place when she thinks that Adam’s being harmed without his consent. See..the thing with OP is that they do thorough testing to determine what someone’s power is and they’ve decided that since Adam can touch Juliette that he must have some type of power of his own…and there’s the rub. Something not so good is going on, and it’s taking a toll on his body and there are consequences here. So Juliette gets mad, almost destroys the place and has even more to deal with since her relationship is now falling apart romantically and she’s made no effort otherwise to make friends with those there. Outside of OP, Warner is desperately trying to find Juliette. he’s angry that she got away but he’s also so in love with her that he’s not willing to let go. It’s only when 4 of the OP residents get taken hostage and 2 get freed, and Warner is taken as a trade for the others that Juliette realizes that there’s much much much more going on here. Shes a bundle of messy teen angsty nerves and i have to say that i kind of like what’s going on. So…so much going on that i feel like i have to hold back and not talk about the parts that i loved but pose a few questions that might be considered leading. 1) can we trust Warner? Do we want to? 2) what’s going to happen with Adam? his health? 3) Does anderson know about his son(s)? 4) Does anderson know about powers (since he knows about Omega Point) and does he have any? 5) Will Juliette be able to use her powers for the right team and which side is the right side? 6) are you team Aaron or Adam? so, i really can’t for the third installment of what i believe to still be an untitled story. Thanks for another amazing step into dystopian fantasy! 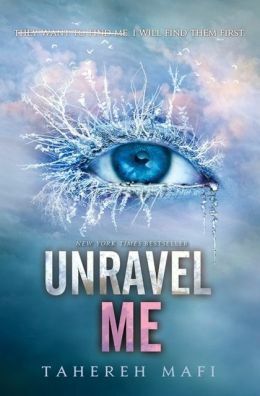 This entry was posted in Dystopian, fantasy, Reviews, Young Adult and tagged Destroy Me, Dystpian, fantasy, Shatter Me, tahereh mafi, Unravel Me by iscm13. Bookmark the permalink.